Whether you blame Obama or a dysfunctional Congress, either way the recovery is hardly a middle-class success story. 1. Workers are taking home their smallest slice of U.S. income on record: At around $15.8 trillion a year, the United States produces more in annual economic output than ever before, but it's not the worker that's benefiting. Instead, corporate profits now account for their largest slice of that pie on record, whereas the slice for workers has been steadily declining. 2. Inequality has widened: The recovery has been good to families earning more than $394,000 a year, but the other 99% of Americans have barely felt it. Whereas income for the richest 1% had grown 31% from 2009 to 2012, income for the rest of Americans has barely budged in recent years, growing just 0.4% over the same time period. That means the richest 1% of American families have captured 95% of the income gains in the recovery, according to economists at the forefront of income inequality research, Thomas Piketty and Emmanuel Saez. 3. The job market still faces a gaping hole: From the job market's peak in early 2008 to its bottom in 2010, the U.S. economy lost 8.7 million jobs -- about half of which were in construction and manufacturing. To this day, the United States still hasn't gained back all those jobs. The economy needs about 1.2 million jobs to get back to the 2008 level, and once population growth is added to the mix, the hole looks more like an abyss. To fill that abyss, the economy still needs about 7.9 million jobs to get back to pre-recession conditions when unemployment was under 5%, according to Heidi Shierholz, economist with the liberal Economic Policy Institute. Even with strong hiring, it could take at least five years to get there. Part of the problem stems from workers dropping out of the labor force. If these "missing workers" were looking for work, Shierholz estimates the unemployment rate would be closer to 10% today, rather than its current 6.7%. 4. The poverty rate remains high: About 46.5 million Americans are living in poverty -- equivalent to 15% of the entire U.S. population. The poverty rate has barely budged during Obama's presidency, marking the first time it has remained at or above 15% for three consecutive years since 1965. 5. Record number of Americans are on food stamps: Amid the recession, the food stamp rolls surged, and as of 2013, 48 million Americans were receiving the benefits -- the highest number since the program began in 1969. The average recipient gets $133 a month from the program, but some of those benefits are now on the chopping block in Congress. Share your story: Were you helped, or left behind by the recovery? 6. The manufacturing revival was a mirage: In his 2012 State of the Union address, the president spoke highly of manufacturers that were bringing jobs back to America. Specifically, he highlighted padlock-manufacturer Master Lock for returning 100 jobs to its Milwaukee factory. Here's what he forgot to mention though: even after bringing a few jobs back to America, manufacturers like Master Lock are operating with a U.S. workforce that's a small fraction of the size it was two decades ago. With automation playing a larger role, and many jobs remaining in cheaper overseas markets (like China and Mexico in Master Lock's case), the story of a manufacturing revival is "overwhelmingly imaginary," said Alan Tonelson, research fellow with the U.S. Business and Industry Council. Overall, manufacturers have added only 568,000 jobs since 2010, about a quarter of those cut in the prior two years. 7. Global trade isn't helping much: Remember when the president unveiled an ambitious goal to double U.S. exports over a five-year period, starting in 2010? With one year left to go, he's far from getting there. U.S. exports to the rest of the world totaled $1.1 trillion in 2009, adjusted for inflation, and reached $1.4 trillion in 2012. They would need to have a gangbusters year, growing another 57%, to reach Obama's goal by the end of 2014. "By any reasonable standards, this goal has flopped miserably," Tonelson said. Plus, more exports mean little for economic growth unless they happen to grow faster than imports. After Obama signed a free trade agreement with South Korea in 2011, exports grew, but imports from the country -- like cell phones, cars and auto parts -- grew even faster. "The president talks about trade and lifting exports, but ignores imports. That's like reporting the results of a football game by giving the score of just one of the teams. You don't know who won," said Lawrence Mishel, president of the Economic Policy Institute. EPI estimates the agreement resulted in the loss of 40,000 American jobs, as opposed to the 70,000 jobs the Obama administration said it would support. We don't have real universal healthcare. 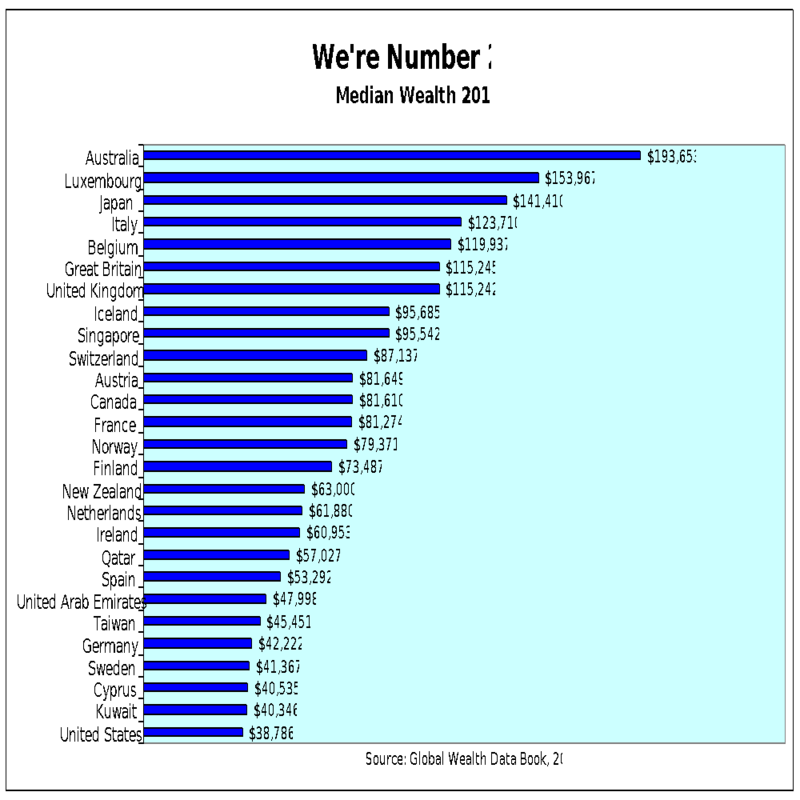 We pay more and still have poorer health outcomes than all other industrialized countries. Should a serious illness strike, we also can become impoverished. Weak labor laws undermine unions and give large corporations more power to keep wages and benefits down. Unions now represent less than 7 percent of all private sector workers, the lowest ever recorded. Our minimum wage is pathetic, especially in comparison to other developed nations. (We're # 13.) Nobody can live decently on $7.25 an hour. Our poverty-level minimum wage puts downward pressure on the wages of all working people. And while we secure important victories for a few unpaid sick days, most other developed nations provide a month of guaranteed paid vacations as well as many paid sick days. Wall Street is out of control. Once deregulation started 30 years ago, money has gushed to the top as Wall Street was free to find more and more unethical ways to fleece us. Higher education puts our kids into debt. In most other countries higher education is practically tuition-free. Indebted students are not likely to accumulate wealth anytime soon. It's hard to improve your station in life if you're in prison, often due to drug-related charges that don't even exist in other developed nations. In fact, we have the largest prison population in the entire world, and we have the highest percentage of minorities imprisoned. “In major cities across the country, 80% of young African Americans now have criminal records” (from Michelle Alexander's 2010 book, The New Jim Crow: Mass Incarceration in the Age of Colorblindness).